IPL. I remember the first few IPLs very well. The manner in which McCullum scored his first century, Kamran Khan's lethal outswingers and his sudden disappearance, Manish Pandey's century, Dhoni's finishes, Shane Warne's captaincy, The worse treatment given to McGrath by DD, The SouthAfrican IPL. When I think about the money monger game of cricket, I still do have fond memories. But the IPL 7th season has not still registered in my mind yet. Every year, I would subscribe to Sony Setmax or SonySix to watch IPL. But this year I have not done that yet; not that I hate the sport. Cricket is still an entertaining game for me even though it has gone through many disasters in recent times. It is not only me who has started disliking IPL. I come across many who have started hating IPL. The social networking platforms are buzzing with political news and discussions related to Politics. Cricket is pushed to the corner in many discussions. What saddens me really is the fact that those IPL heroes who we consider as National Heroes have failed to cast their Vote this year and are busy playing cricket in Dubai. Still some of them willget a Bharat Ratna in the years to come and we all will praise them. I hate to rant on my humor page. (But ennayum rant panna vachuteengaley). I would like to dedicate this post to Nehra the latest CSK recruit. This epic picture will stay in my memory when I think about IPL7. 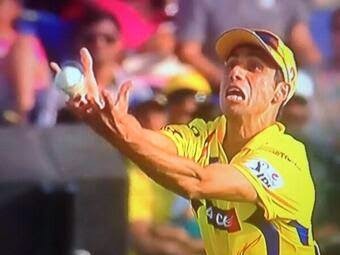 This is Nehra dropping a catch in the match against Punjab. Cricinfo's comment on the catch was priceless. The comment was "Vintage Nehra"